Yesterday, the 46 businesses and individuals nominated across 15 categories for this year’s KEiBAs were announced, and Sleeping Giant Media is super proud to be in the running for not one, but two awards! 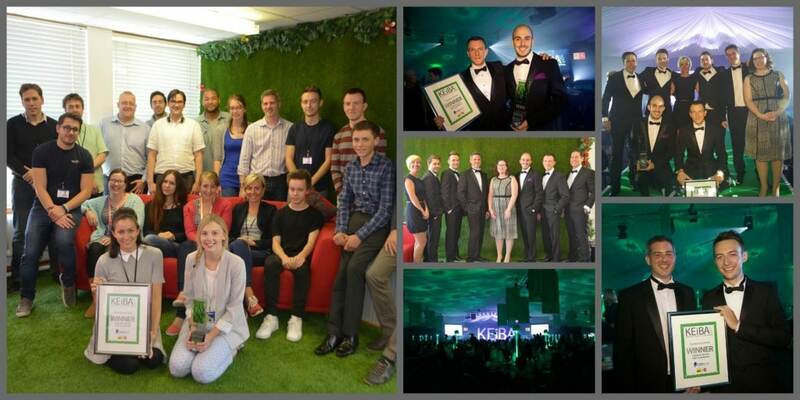 The Kent Excellence in Business Awards (KEiBA) are held annually to celebrate the achievements of outstanding businesses and individuals throughout the county. Now in its seventh year, 2015 saw a record number of entries for the awards which are jointly run by KM Group and Kent County Council. This year’s event will see proceeds going to Porchlight, a homeless charity based in Kent, and Oasis, an organisation providing domestic abuse refuge. At the 2014 ceremony Sleeping Giant Media was awarded the Customer Service and Commitment Award, a category which we are once again in the running for this year. For 2015 however we’re adding another string to our bow, with a second nomination in the SME Business of the Year category. Now SGM and the other nominees have a nerve wracking six week wait to find out who will take home the prizes at the event next month. Time to dust off our bow ties!